In the most recent budget review, the Portland Children’s Levy Allocation Committee members were tasked with cutting $3.7 million from their budget. According to the Children’s Levy staff, “These steep reductions are the result of reduced revenues because of a depressed housing market and compression of city property tax collections brought about by lower real market property values.” Tough decisions needed to be made. The Portland Children’s Levy supports dozens of programs serving children in early childhood, afterschool, and mentoring programs, including Bike Club. The program has been funded by the Children’s Levy since 2005 and has helped more than 1,000 kids gain life-long skills, a reliable and self-propelled way to get to school and build self-confidence. We walked into Monday’s Allocation Committee meeting knowing it was going to be rough. But not like this. Based on previous communications with PCL staff, we were expecting a 30% cut to Bike Club. But the Allocation Committee made the final decision. In the heat of deliberations and negotiations, when Committee members were trying to mitigate overall impact on children, Bike Club was sacrificed. Providing no opportunity for us to comment and acting against staff recommendations, the Committee added Bike Club to the “de-fund” list. Bike Club is a hands-on afterschool program for 4th and 5th graders whose families are living on low incomes. 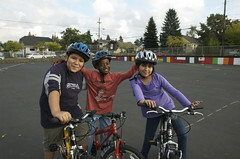 Bike Club is delivered through the Schools Uniting Neighborhood (SUN) programs in six local schools. In Bike Club, students spend their afternoons learning to fix flat tires, to ride safely from school and home, and how to use a bike map to get around. Kids earn a bicycle, helmet, lock and tools to fix a flat tire by the end of the program. But Bike Club is about much more than the bike. Bike Club is about healthy kids learning better. Bike Club is about ensuring children from low-income families have a safe and reliable way to get to school. Bike Club is about making friends and building life-long skills. Last spring a 5th grader named Rafael enrolled in Bike Club. Rafael’s father and a teacher aid before the program began, “Keep an eye on Rafael. He has a tough time concentrating in his classes.” Club instructors paid attention and were pleased to find an attentive student who was talented at bike repair, had a keen eye for road hazards, and the ability to mobilize and energize other kids. During one lesson, Club instructors test students’ technical knowledge by deflating tires, loosening bolts, and detaching brakes. Students are then asked to repair the bikes so that they are safe again for riding. Rafael was not only the first to finish, he then jumped in to help the other students. Soon, all the bikes were repaired and the group was on the road and ready to go. This is just one of many stories in which students who might have a hard time in the classroom thrive in an outdoor, hands-on setting. Through Bike Club, kids build skills, knowledge and confidence. We believe that Bike Club is an important program and is just one piece of a continuum of services that empower children through SUN afterschool activities. On a program level, the funding cuts mean that the SUN programs have one less class to offer. On a community level, it represents the loss of one piece of the larger solution of promoting physical activity and ensuring kids from low-income families have a reliable way to get to school. The funding cut does impact fall programs, so we are beginning conversations about alternate funding sources. We hope to offer at least two Clubs this fall and will be seeking funding through donations, grants, and earned income. A Club enrolls twelve kids, covers 24 hours of afterschool instruction and activity, and provides a refurbished bike, a new helmet and a toolkit to each participant. An entire Bike Club costs $6,600, which works out to about $550 per child. We are committed to continuing our strong and innovative youth programming. While we are disappointed that that Portland Children’s Levy chose to discontinue our funding for Bike Club, we will take this opportunity to reevaluate our youth programs and the needs of our partner communities. Do you believe in the power of bicycles? If you want to ensure that kids from low-income families can access bicycles and safety education, please consider making a donation to the Community Cycling Center today.